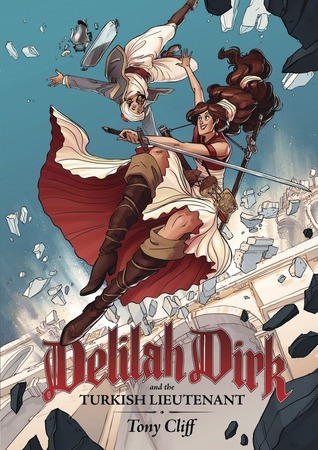 Delilah Dirk & the Turkish Lieutenant is a graphic novel written and illustrated by Tony Cliff. Our protagonist is actually the aforementioned Turkish lieutenant, a young man named Selim. Selim is a hapless lieutenant in the Sultan’s guard in Constantinople. His passion is the brewing and blending of tea, but it isn’t something for which he gets much respect. She has traveled and trained all over the world. And she is here to “repatriate” some of the Sultan’s antique scrolls. When Delilah inevitably escapes, the Agha blames Selim and orders his execution. Delilah saves him, thus thrusting him into her own life of adventure and intrigue. This was a delightful read. Delilah is, as far as she can be trusted, a runaway English noblewoman turned adventuress. She’s very much a Regency-era Lara Croft, as far as I can tell. She reminds me a bit of Gail Simone’s version of Red Sonja too. She’s tough, irreverent, thoughtless, but also kind. She had nothing to gain by saving Selim, but she did it anyway. On the other hand, she’ll burn down a town’s only bridge as part of a getaway plan. She’s maybe not a great role model, but she is a great deal of fun. Selim, on the other hand, is gentle. He isn’t, on the surface, cut out for a life of adventure and intrigue. But he is, if nothing else, a loyal friend. The art is good, but it didn’t stand out as unusual to me. In a way, I’m glad of that. If I’d spent more time looking at the craft of the art I wouldn’t have had as much focus for the story. If you like adventure books I highly recommend this one.